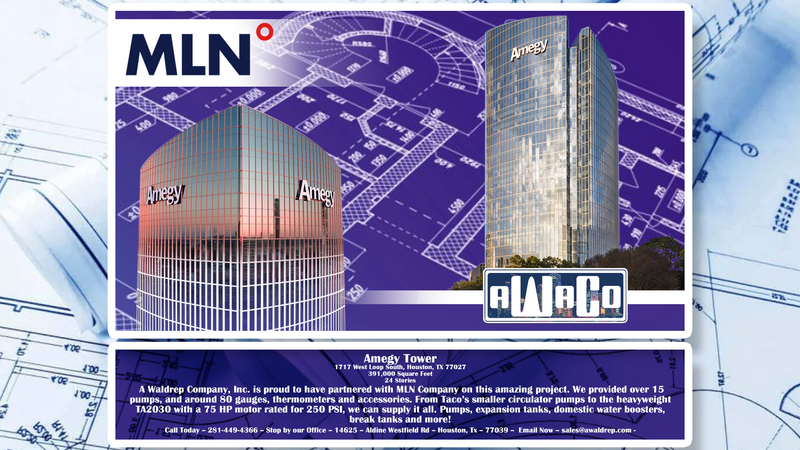 One of the many projects we have been proud to have worked with MLN on, Amegy Tower is 24 stories tall, and A Waldrep Company, Inc. was able to provide pumps ranging from circulators all the way up to 250 PSI rated TACO TA pumps with 75 HP motors. We also provided expansion tanks, and a whole host of gauges, thermometers, flow switches, relief valves and more. Contact A Waldrep Company, Inc. now so we can begin designing a system for your particular application. From high rises to warehouses and everything in between, we have the solution for you and your customer. Our friendly and knowledgeable sales and estimating teams are ready now! !